Receivers and amplifiers with the ambio function were products which, apart from stereo, could also reproduce the ambience or sound information of a room. Ambient information was included on most stereo vinyl recordings but could not be reproduced by a sound system with two loudspeakers or an ordinary stereo amplifier. 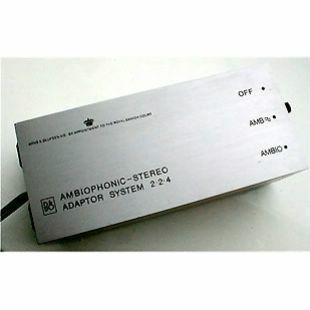 Bang & Olufsen systems with the ambio function had facilities which electronically subtracted the difference signal (i.e. the difference between left and right channels) which contained ambient information. This information was fed into two extra loudspeakers which were placed as side speakers in a room. Ambiophony was an extension of stereo reproduction and enhanced the sense of realism. It could be used with nearly all stereo programme materials. "Ambio is an extension of the type of sound reproduction known today as stereo. Ambio is reproduced through four loudspeakers - two more than required for stereo. Ambio is sensed as being more spatial and acoustically more life-like than conventional stereo. The sound picture has greater depth because you get the added feeling of being present of the concert hall, listening to the actual performance. Ambio is based on the principle that in the concert hall you not only receive sound impressions directly from the performing group, you also get reflections from the wall and ceiling. The spatial sensation is instrumental in providing the auditory experience and even a two-speaker stereo system will not bring it out fully. And you cannot accomplish the effect by connecting additional speakers to a conventional stereo amplifier because you still have the same left and right front signals merely distributed to more speakers. In the Beomaster 4000 the left and right channels are subtracted from each other electronically and the resulting difference signal contains a certain amount of spatial information which is fed to the two new side speakers. Many existing stereo records, FM broadcasts and tape recordings contain this spatial effect to a greater or lesser extent. In a concert hall, room acoustics will be recorded together with the actual programme material, appearing as time-delayed signals in both left and right channels. Recordings made in a strongly damped studio contain few time-delayed signals and the spatial sensation will therefore depend on how the producer mixed the sounds from the various instruments, perhaps adding acoustical effects by electronic means. Multi-channel records such as SQ records, which are intended for use in a four-channel matrix system in order to bring out the sound effects , can be played successfully through the Beomaster 4000.